The second Lesson for the Dippity Doo Workshop I joined came in last Tuesday. 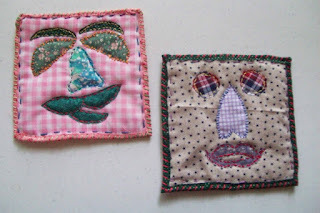 Basically, the Lesson Plan was to create facial elements and handstitch them to the fabric sandwich. Here's mine .... they are starting to take on a little personality. I'm thinking about calling mine Padillies ... as in a Padilly Family and having thoughts as to what I would do with them. Lesson Three came in last night; I haven't looked at it yet; on my Calendar for Thursday.